The definitive host (human) passes eggs and gravid proglottids from the mature tapeworm in its small intestine through feces. 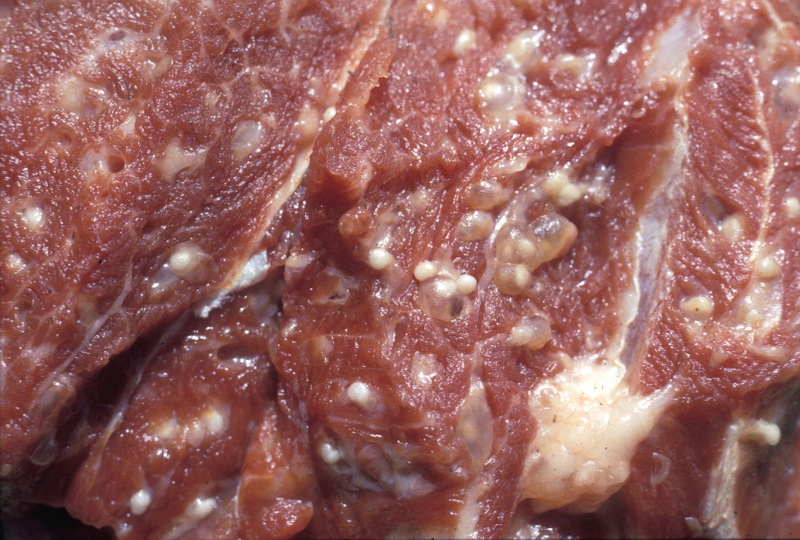 The intermediate host (pig) ingests food contaminated with feces, and therefore, the eggs and proglottids. Infection with T. solium in the small intestine is a condition known at taeniasis. 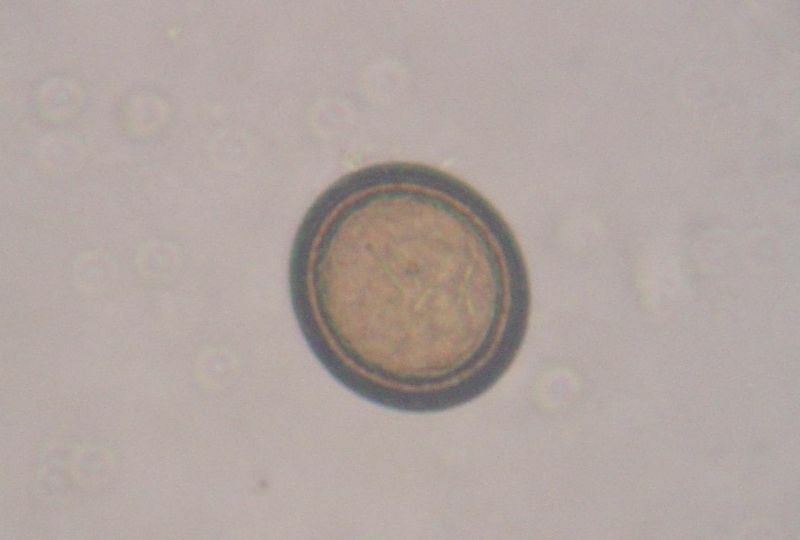 During taeniasis, a cysticercus from uncooked meat develops into an adult tapeworm, which attaches to the intestinal wall in the small intestine via its scolex and remains there to grow. Taeniasis is often asymptomatic, with the only sign being the presence of proglottids in the feces. It is easily treatable, usually with the antilhelminthetic drug Praziquantel. Taeniasis is not the main risk stemming from T. solium infection. Cysticercosis - a result of auto-infection - features far more dangerous pathogenesis in humans. Oncospheres penetrate cells in all types of human organs, causing cysticerci, similar to those seen in pigs. 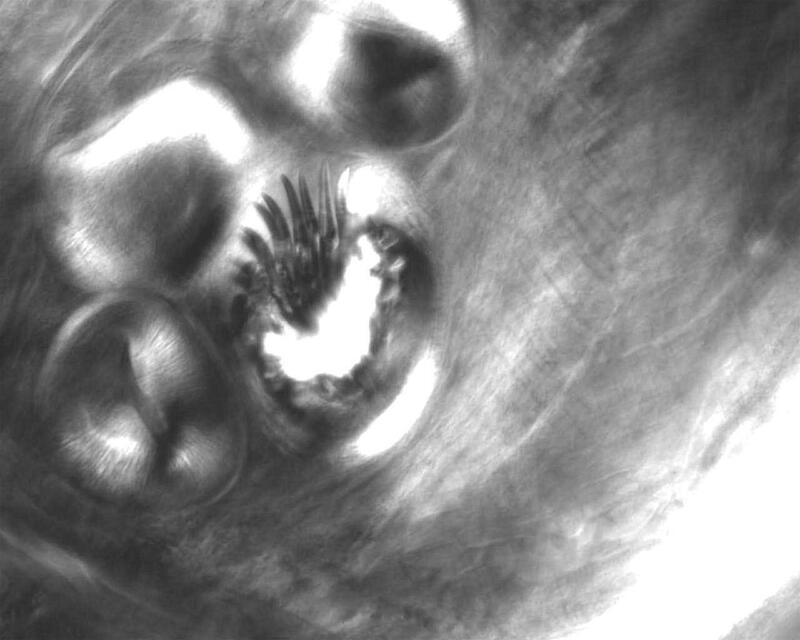 Below is an close-up image taken of the larval form of T. solium. The hooks and suckers of the scolex are clearly visible in the cysticercus. If the cysts remain in tissues for too long, they may die and calcify. This can be problematic in patients suffering from neurocysticercosis. The death of these larval forms is often when patients will experience debilitating pain, seizures, and death.